# ARAKAWA/GINS /// Architecture of the Conatus: "Tentative Construting Towards a Holding in Place"
Some of my readers are maybe surprised to see the editorial line of the blog shrinking day by day to something more and more (too?) precise. The reason for it is partially temporary as part of a strategy towards the completion of a project that I will be happy to unveil in the coming weeks. Until then, I would like to present one more article about the work of the Reversible Destiny Foundation (Arakawa + Madeline Gins) for a more acute understanding of their theoretical and design work (which are not really discernible one from another). The title Architecture of the Conatus I chose in reference to their book Architectural Body (University of Alabama Press, 2002) is a direct reference to Spinozist philosophy (once again!) and can therefore be put in dialogue with the recent series of article dedicated to the latter. For Spinoza, each assemblage of substance i.e. body, “as far as it lies in itself, strives to persevere in its being” (Ethics, part 3, prop. 6). In other words, each thing will be continuously involved in a process of effort to keep the integrity of the material assemblage that constitutes it. Any animal (humans included), for example, will keep its body together as long as the latter is involved within the vital process. When this animal dies, however, its body will decompose and its matter will be reassembled in other bodies (soil etc.). Arakawa and Madeline Gins present a similar concept in their book, but before coming to that, I should probably introduce the latter. Arakawa and Gins calls Architectural Body the composition of a living material assemblage constituted both by the human body itself and its direct environment. Just like for any body, such an assemblage does integrate movement of the matter within it (think of a human body’s biology for a simple example). The Architectural Body also involves the biological and other microscopic movements of its element’s matter; nevertheless, it adds to this microscopic scale, a macroscopic one in which the human body continuously composes material relations with its environment . 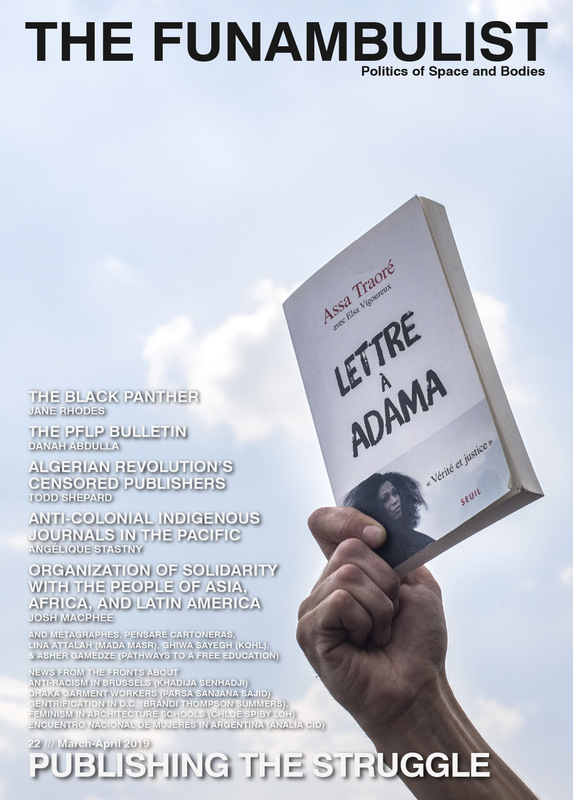 All excerpts are from the original version; however, since a (very good) French translation exists as well, I also included it at the end of this article. Going back to the notion of conatus, Arakawa and Gins introduce their concept of bioscleave, that can be interpreted as the Spinozist notion of substance, as the universal (theological for Spinoza) ensemble of matter and its internal energy. Rather than the Spinozist necessary perfection of the substance, Madeline Gins and Arakawa talk about the balance of the bioscleave without which, no vitality can be developed. Start by thinking of architecture as a tentative constructing toward a holding in place. Architecture’s holding in place occurs within and as part of a prevailing atmospheric condition that others routinely call biosphere but which we, feeling the need to stress its dynamic nature, have renamed bioscleave. The last excerpt introduced the peculiar notion of tentative constructing toward a holding in place (very close from the Spinozist definition of the conatus) or its beautifully translated version into French, construction tâtonnante en vue d’un maintien en place. I am giving the translation on purpose as the word “tâtonnante“, used by Monique Chassagnol (the book translator) transcripts, in my opinion, an even more expressive meaning of the Architectural Body than the English word tentative used by the authors. Tatonner in French incorporates the notion of tentative but adds to it, the idea of groping, a highly corporal idea. One might remember Madeline Gins’ book Helen Keller or Arakawa (Santa Fe: Burning Books, 1994) including the famous deafblind author in their discourse. This makes a lot of sense as the Architectural Body involves only a limited visual and auditive characteristics compared to its hyper-tactility. One of the first experience I did, the first time I visited the Bioscleave House in October 2011, was to used a blind cane and go around the house central terrain while closing my eyes. It becomes then easy to understand how one could acquire more and more ease experiencing the terrain “only” (but there is no “only” here) with one’s feet. By doing so, one composes a more balanced architectural body. Staying current with bioscleave, remaining alive as part of it, involves keeping pace with the tentativeness it brings to bear, staying focused on the elusiveness as such of this tenuous event-fabric or event-matrix. Everything is tentative, but some things or events have a tentativeness with a faster-running clock than others. So that there can at least be a keeping pace with bioscleave’s tentativeness, it becomes necessary to divine how best to join events into an event-fabric, which surely involves learning to vary the speed at which one fabricates tentative constructings toward holding in place. Architecture occurs as one of many ways life sees fit to conduct and construct itself, a form of life, and all forms of life have, without doubt, as of this date, but a limited and uncertain existence. Even so, thus far only nomads have held architecture to be as a matter of course tentative. To finish this long article (I apologize that I could not reduce the excerpts to their very essence), I would like to introduce a last excerpt in which Madeline Gins and Arakawa are directly addressing the reader asking her/him to realize a small assignment that can work in any space (s)he reads the book. They go as far as making this same reader actively enter the narrative as (s)he speaks in the text. The assignment consists in rotating of 10 degrees the entirety of the room (s)he is currently in to increase her/his awareness of the physical space surrounding her/him. 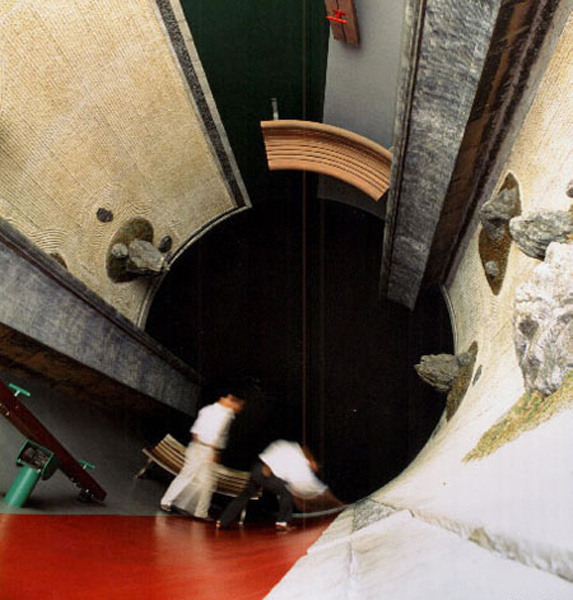 The extreme manifestation of such an imaginative space can be found in Ubiquitous Site – Nagi Ryoanji, built in 1994 in Japan, which concretize the same assignment, except that it is no more 10 degrees of inclination but the infinity of degrees betwee 0 and 360 as the floor is cylindrical (see photo above). Contribute your room, your architectural surround of the moment, to this text. For your room to be of use in what follows, it needs to be transformed into a work of procedural architecture. Note where in the room you are and the direction in which you are facing. To have this room—the room in which you happen to be reading this—stand out distinctly as the room it is, select and keep vivid a representative group of its features. Now take the room and give its floor a ten-degree tilt along its longest length (if the room is square, either side is fine). Make a double of your room thus tilted and place it next to the original. Seesaw the floor of the double so that it ends up tilting in the opposite direction. ARCHITECT: We have now been in both rooms. It is apparent that the two together frame the impact on us of an architectural surround, that is, of the room in which you are reading this text. READER: I lean differently into the situation of exactly this room within each of its exemplars. Translated Excerpts into French by Monique Chassagnol in Arakawa & Madeline Gins, Le Corps Architectural, Paris: Manucius, 2005. Le biosclive – on le respire, il nous fait vivre – est constitué de parties et d’éléments, la majorité d’entre eux étant agencés selon un ordre donne, même s’il se présente comme une masse extrêmement confuse dont les constituants actifs sont indiscernables. Quiconque évolue au sein de cette masse chaotique, de ce mélange d’ordre et de désordre, y découvre de la conscience située. Etre partie inhérente du biosclive, vivre à travers lui, signifie demeurer en phase avec le tâtonnement qu’il effectue, rester focalisé sur la nature insaisissable et tenue de ce tissu, de cette matrice, d’évènements ont un rythme plus rapide que d’autres. Afin de suivre le rythme (du tâtonnement) du biosclive, il devient nécessaire de prévoir comment lier au mieux les évènements entre eux, en tisser une trame, ce qui sans doute signifie apprendre à varier la vitesse à laquelle on effectue des constructions tâtonnantes en vue d’un maintien en place. L’architecture opère comme l’une des manières que la vie considère adéquates, de se conduire et de construire. C’est une forme de vie, et il est certain que toutes les formes de vie ont, du moins à ce jour, une existence limitée et incertaine. Néanmoins, jusqu’ici seuls les nomades ont considéré l’architecture comme incontestablement provisoire. Faites participer votre pièce, votre milieu architectural du moment, a ce texte. Pour que votre pièce soit utilisable dans ce qui suit, elle a besoin d’être transformée en un ouvrage d’architecture procédurale. Noter l’endroit de la pièce ou vous vous trouver et la direction dans laquelle vous regardez. Pour que cette pièce – la pièce ou vous lisez en ce moment ce livre – se révèle clairement en tant que ce qu’elle est, sélectionnez et gardez a l’esprit un ensemble représentatif de ses caractéristiques. Prenez maintenant la pièce et faites pivoter le sol de 10° sur sa plus grande longueur (sur n’importe quel cote si la pièce est carrée). Faites un double de cette pièce inclinée de la sorte et placez-la à cote de l’original. Faites basculer le plancher du double de façon à ce qu’il finisse par s’incliner dans la direction opposée. ARCHITECTE : Maintenant nous sommes allés dans les deux pièces. Il apparait que les deux, mises ensemble, constituent l’impact qu’a sur nous un environnement architectural, c’est-à-dire la pièce dans laquelle vous êtes en train de lire ce livre. LECTEUR : J’appréhende différemment l’inclinaison de cette même pièce dans chacune de ses deux représentations.